I recently made a set of heart cloths to sell on my Etsy site. Of course in the process it came to me how simple this really is to do but how scary it can be to a new knitter or even a relatively experienced knitter that has never tried any type of color-work knitting. And so it was created, a brand new video explaining the basics of intarsia, a type of color-work knitting. The video can be viewed on YouTube or right here. 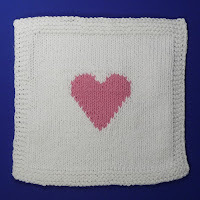 You can get the pattern, Intarsia Heart Dishcloth, for free; I do appreciate that sharing the pattern be done via the link I've provided.